Ed. moderne: “S’ensuit la teneur des lettres que le roi notre sire écrivit à l’empereur, aux rois, ducs et autres princes de toute la chrétienté”, in Champion, Pierre, Procès de Condamnation de Jeanne d’Arc, texte, traduction et notes, 2 vol., [1920-1921], t. II, introduction, traduction et notes, Paris, Honoré Champion Éditeur, 1921, pp. 311-314. The Trial of Jeanne d’Arc, Translated into English From the Original Latin and French Documents by W.P. Barrett, With an Essay On the Trial of Jeanne d’Arc AND Dramatis Personae, Biographocal Sketches of the Trial Judges and Other Persons Involved in the Maid’s Career, Trial and Death, by Pierre Champion, Translated From the French by Coley Taylor and Ruth H. Kerr, Illustrations by Frank P. Rennie, New York, Gotham House, 1932, pp. 372-376. Lettre d’Henri VI aux princes de la chrétienté - 8 juin 1431. Commento: Waugh, W. T., “Joan of Arc in English Sources of the Fifteenth Century”, in Historical Essays in Honour of James Tait, ed. J. G. Edwards, V.H. Galbraith, and E.F. Jacob, Manchester: Butler and Tanner, 1933, pp. 389-391. 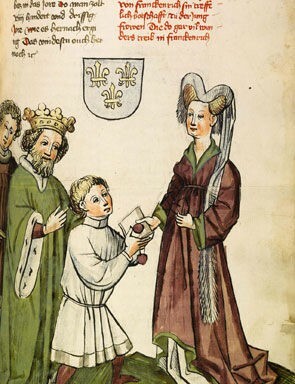 L’Imperatore Sigismondo e Giovanna d’Arco, miniatura tratta dalla cronaca di Eberhard Windeck, ca. 1450.